The final presentation of the Hot Chips event this week is from Intel, with a talk on its next generation Xeon Scalable platform, Cascade Lake. 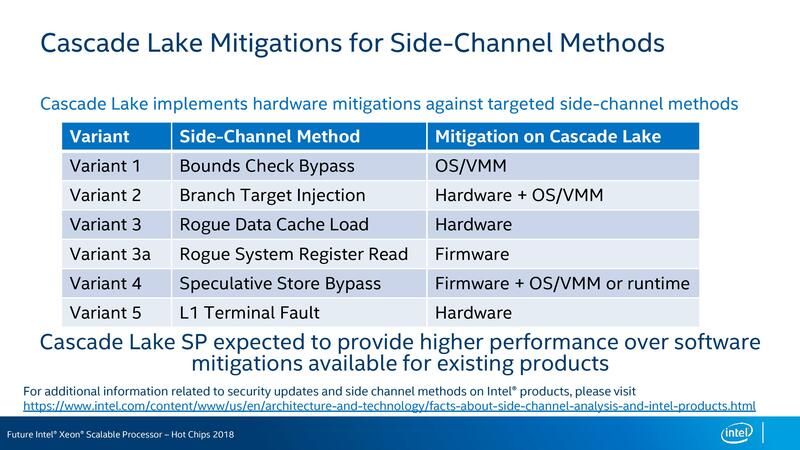 We recently learned about Intel’s Xeon Roadmap at the recent Datacenter Insider Summit, consisting of Cascade Lake in 2018, Cooper Lake in 2019, and Ice Lake in 2020, and now Hot Chips is the first chance for Intel to add some more information to the mix. Previously this would have been done at events like IDF, over several hours, but Intel only has 30 minutes on stage here. We picked up the slides before the presentation. Intel is using the opportunity to expand on Cascade Lake’s previously announced features: new instructions for machine learning by taking advantage of the AVX-512 unit, and how the platform is set to be protected / hardened against attacks such as Spectre and Meltdown. We also have confirmation about how the new Optane DIMMs, Apache Pass, will be enabled through the platform. Unfortunately, for those expecting an IDF-like substantial talk about the design of the chips, how the SKUs will be separated, or what the product stack will look like, this was not it. We have a feeling that Intel will be drip feeding information about Cascade Lake in this manner. However, Intel’s main play here is that a significant amount of the server and enterprise industry desperately want Spectre and Meltdown hardened processors, and will pay for them. When Intel stated that they expect Cascade to be their fastest ramping processor, make no mistake that this is likely to be true, for the reasons of security. The question marks will obviously come on price, which has yet to be announced, but Intel could easily argue ‘how much is security worth?’. With the range of new attacks, Intel and others moved quickly to enable firmware and operating system remedies. The downside of those remedies was a potential loss in performance, mainly due to kernel switching, that on the latest platforms could account for 3-10% performance (or more old older systems). When we spoke with Lisa Spelman, VP of Intel’s DCG, we were told that the hardware-based mitigations in Cascade Lake would have an impact on the performance loss – exactly how much was not stated, and we were told that ‘the comparison is sort of apples to oranges – either way performance is set to be increased [because of platform updates]’. Lisa did categorically state that ‘the hardware fixes put the performance back on track’, which is the key takeaway. Variant 1 is still to be tackled at the OS level, with variants 3a and 4 through firmware and OS updates. Variants 2, 3, and 5, will be solved in hardware, requiring no extra additions. So while the new processors have fixes in place, not all of them will be hardware fixes. The firmware fixes might as well be hardware, given that the system will launch with these by default, but the OS fixes will have to be pushed before platforms are released. The non-hardware fixes have the potential for performance regression, however as stated above, the platform as a whole should be at a higher performance level than Skylake. Intel did not state what the lead time was for different variant attacks to be added in hardware beyond Cascade Lake, however the earlier they know, the better. Lisa Spelman did state that every new processor features security updates, and the teams they have will be working hard to provide the best solution.